There are a handful of common “misconceptions” about preparing your screens that are repeated often enough that they appear to have a life of their own. These common fallacies are often rooted in some past truth, or in a misplaced technology. But, these statements are heard and repeated often enough to be known as the nine lies you’ll hear about screens. Lie # 1: To do process and simulated process printing, or any high end printing, you cannot use wood frames. Let’s be realistic, retensionable frames will give you better and more consistent tension for fine lines and dots, and for repeated use there is no better option. But excellent work is being done all over the world using wood frames today. There was a reason, 20 years ago, why wood frames were less than desirable, primarily because of their construction and the methods of attaching mesh to wood. But today, a newly stretched wood frame will give you excellent results. Much of the erroneous advice today is based on these prior experiences and information. Lie # 2: You must use high tension mesh to do high quality work. I’m certain there’s a place for high tension mesh in other industries beyond textile screen printing. But, reality on the garment printing production floor says high tension mesh offers you a higher risk of catastrophic tearing during the run, and difficulty getting the kind of deflection of the fabric you’ll need to bring the squeegee blade into good contact with the substrate (laying down enough ink). Most of the high end printing you will stop and admire at tradeshows has been printed using standard mesh at standard tensions. Lie # 3: Any textile printing can be done on 110 mesh. At the other extreme is the idea that 110 mesh is the end-all, be-all, of textile printing. Again, 20+ years ago this was common advice for an industry where very basic single color work was predominant. It was easy then to buy a couple dozen screens of a single mesh and be a happy small-time printer in your garage. Today, with the art opportunities available to absolutely any printer, the day of the 110-only screen printing shop has long passed. Yet, I speak with new printers all the time who have been given this stale information as gospel. 305 for process and simulated process. Lie # 4: It’s impossible to print plastisol ink through a 305 mesh. I include this lie because I heard it again recently. A screen printer I know was about to print his first simulated process job, and ordered 305 mesh screens from a major and long-time supplier. This supplier (or at least the one sales rep on the phone) refused to sell these screens, explaining that it is impossible to print plastisol ink through such a fine mesh. Well, hundreds if not thousands of printers would certainly beg to differ. And most of us print through 305 mesh on a regular basis. And yes, despite arguments I have with suppliers and even “industry consultants” on a fairly regular basis, you can thin down your plastisol inks to help print them through fine mesh. (If not, I’m expecting a return of many hundreds of thousands of shirts I’ve printed over the years with reduced ink.) Use a curable reducer rather than a soft-hand extender. Just as they sound, reducers reduce the viscosity of the ink. Extenders simply make more of the ink color you are using. Many people confuse the two. Lie # 5: There’s no difference between white or colored mesh. You won’t hear this misinformation much any more, but it’s still floating around out there in the screen printing world. So why are there white and also colored fabrics? White fabric will act much like fiber optics when you apply UV light. The light will make a turn and travel along the white fabric fibers, and can potentially expose your emulsion from the inside out. Colored fabrics will absorb the light instead, keeping it from moving behind your stencil and exposing your emulsion. Lower mesh screens are commonly white because the stencils being created are heavier blocks of artwork where this movement of light will not have a detrimental effect. But, with finer lines and halftone dots, any movement of light may cause this fine work detail to be destroyed. The transition point from white to a color mesh is generally about 156. That’s why you’ll see both white and yellow/orange mesh at the 156 mark, white below, and color above. Degreasing your screens removes oils, dust and other contaminants from your mesh before coating. Degreasing is best done as close to the time you coat as possible. While screens are fairly tough and can be given some rough treatment, special care should be taken with them once the cycle of preparation begins. Lie # 6: It’s only necessary to degrease your screens one time. There are some who believe that the degreasing process in some way prepares a screen for the process of coating and exposure for all time, no matter how many times that screen is recycled through the process. Yes, when mesh or finished screens arrive in your shop, they are likely contaminated with machine and human oils, not to mention dust and other contaminants from their place of origin. The fallacy is in the belief that additional contamination does not occur in your own shop. Screens must be put through the entire preparation process, including degreasing, each and every time you choose to reclaim and reuse them. Lie # 7: Always use an abrader on a brand new screen. Another “prepare it once” theory is that a screen must be abraded before being coated for the first time. This lie is actually a confusion of processes. An abrader is in fact a degreaser with tiny abrasive particles that will “rough up” the surface of the mesh. The reason for this roughening of the surface is to make for better adhesion of capillary film, not direct emulsion. Capillary film is meant to only adhere to one side of the screen, so this roughened surface gives the film something to hold it more securely onto the screen surface. 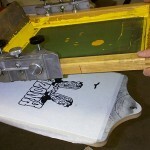 Most of us use direct emulsion, applied with a scoop coater to both sides of the screen. The emulsion will actually adhere to itself through the screen openings. Abrading these screens is only a destructive step in the process. Why do you think a mountain climber would never use a rope that had been severely abraded on the previous climb? A better chance of breaking would be my guess. It’s the same with screen mesh. All those tiny tears and abrasions will weaken your screen causing an accelerated loss in tension and a higher risk of tears to the surface. Lie # 8: You must use multiple coats of emulsion to produce a quality stencil. Two and one, two and two, one and one with a drying step and repeat, etc., are the coating instructions I hear most often. 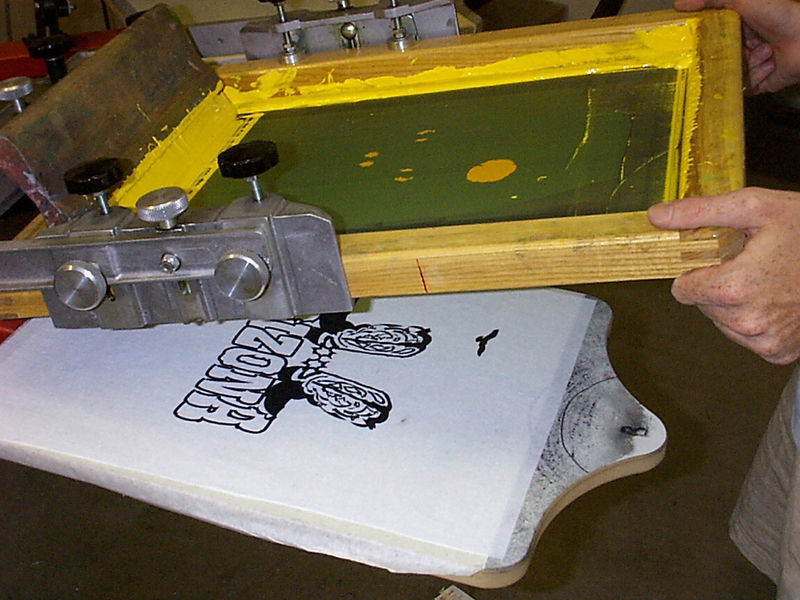 For nearly any garment printing, a single coat of emulsion on each side of the screen will suffice. The first coat goes on the print side, and the second on the squeegee side. This second coat pushes emulsion back through the screen for the heaviest deposit left on the print side. Follow by drying the screen with the print side down for more movement of emulsion to the print side. This will give you a good smooth surface to place your film positive and expose your screen. Any more lay down of emulsion will only increase your drying time, exposure time, and raise your chances of underexposing a thick layer of emulsion. Lie # 9: You must use multiple coats of emulsion to reduce or eliminate pinholes. The reason most often cited for multiple coating of emulsion, whether in one process or recoating after a drying step, is to reduce the chance of pinholes. This is a common bandage approach to screen preparation. In reality, those pinholes are a result of contamination that was either missed during degreasing, or dust and contamination that came to rest on the screen before coating or during the drying process. Properly degreasing, and then protecting your screens once the process begins, should eliminate the need for multiple coats of emulsion. Nine lies, nine statements, rooted in some level of truth, but misplaced in the manner in which they are sometimes offered. Know the truth, and know a better way to prepare your screens.